The tragedy in Orlando has resounded around the world. I’m still in a state of shock and grieving, wondering how such evil and hatred still exist in our world today. I am worried for our future, and I know I am not alone. I know I am united with others in my despair. 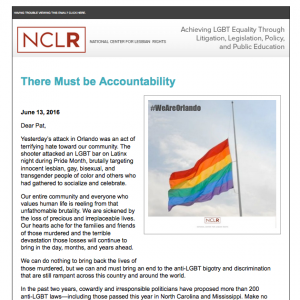 This email from The National Center for Lesbian Rights landed in my inbox yesterday, and it brought me some comfort. First off, Kate Kendell immediately conveys the emotional turmoil that she, I, and you — that anyone who values human life — has been experiencing since the fateful news of June 12. I and countless others can relate. Because it’s not just about the gay community; it’s about humanity. This tragedy has resulted in an outpouring of emotion, but in a way, it has brought us together in solidarity and reminds us of the importance of human rights for everyone. It goes far beyond any hashtag, deeply penetrating America’s collective consciousness. How we respond to this horrific attack will be a test of our nation’s character, witnessed on a global scale. As we reflect on and mourn these terrible losses, let us find the strength to transform our pain and grief into collective action and a deep, unshakeable resolve to hold ourselves and our elected officials accountable for building a world of equality, peace, and justice. Demanding action, even in the face of tragedy, is still an option. Tragedy can and does represent the progress that we so desperately need, the battles that need to be fought hard, and the positive change that we need to keep on striving for. If anything, tragedy has the ability to motivate action, from one corner of the world to the next, to unite people, and to inspire us all to be the change that we want (and need) to see. That’s the power of email. Previous post: Power of Nonprofit Storytelling | Over $6k raised through IndieGoGo for bed sheets? You better believe it! Power of Nonprofit Storytelling | Over $6k raised through IndieGoGo for bed sheets? You better believe it!